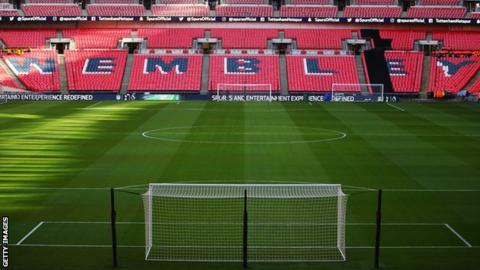 Fulham owner Shahid Khan has withdrawn his offer to buy Wembley Stadium from the Football Association after the plan became “divisive”. Khan had offered £600m for the national stadium, with the FA retaining the Club Wembley hospitality rights, which it valued at £250m to £300m. The move was “more divisive then expected”, said FA chief Martin Glenn. Khan has not ruled out making another bid in future if there is more support from FA Council members. The FA had said it would invest the proceeds of the sale into improving grassroots football facilities. FA executives made a presentation to the FA Council last week about why they were backing the sale to Khan, and the 127 council members were scheduled to vote on the proposed sale on 24 October. But a senior FA source told BBC Sport that the board believed the odds were slightly against the purchase being backed, given the strong objections of some councillors to the home of English football being sold off. FA chief executive Glenn said Khan had believed his offer “would be well received by all football stakeholders”. However, Glenn added: “At a recent meeting with Mr Khan he expressed to us that, without stronger support from within the game, his offer is being seen as more divisive than it was anticipated to be and he has decided to withdraw his proposal. Khan, who planned to move his NFL American football team – the Jacksonville Jaguars – to Wembley, said he wanted “to do right by everyone in a manner that strengthens the English game and brings people together, not divides them”. He added: “Unfortunately, given where we are today, I’ve concluded that the outcome of a vote next week would be far from sufficient in expressing the broad support favoured by the FA chairman to sell Wembley Stadium. The FA had pledged to keep showpiece events, such as most England internationals and the FA Cup final, at the stadium under a pre-agreed hire fee. The FA said only one in three grassroots pitches are of adequate quality and it would invest in facilities. Opponents had suggested selling an iconic national venue was a short-term plan which the FA would live to regret.